Minutes of the last AGM held on 12th March were accepted unread. 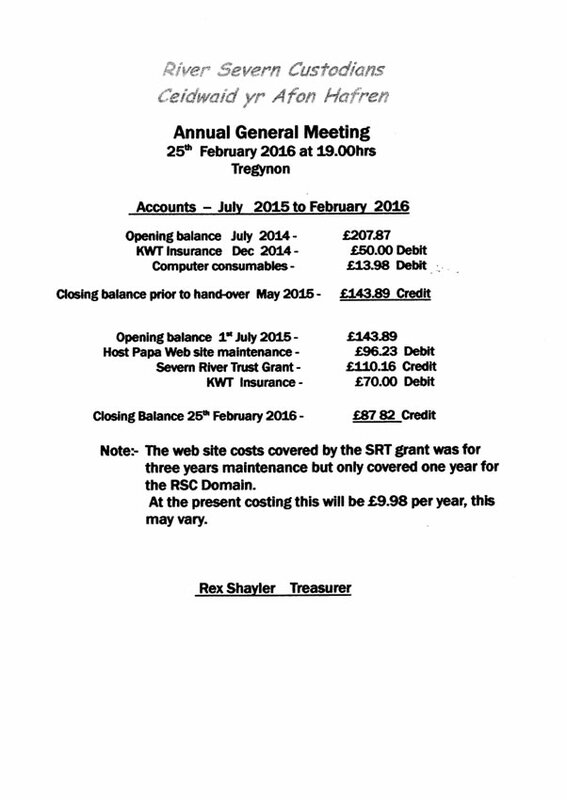 The annual accounts were presented by treasurer, Rex Shayler. A copy is appendix A. Rex suggested we might need funding for possible emergency claims not covered by our insurance. Rex is to check on details of what our insurance does cover, particularly our hogweed activities. In future, we should accept donations for presentations that we give to community groups. We should also consider asking for sponsorships from local companies. Peter will explore this possibility with some of his contacts. The accounts were accepted by the meeting. Activities during 2015/16 were summarized by Mike Davies. These included presentations to local clubs, associations and schools publicizing the river as a community resource and the work being done by the Custodians. We participated in the Food Festival and our stall attracted quite a lot of interest. The bird and bat boxes that we installed in Dolerw Park have been monitored and the bird boxes are being well used but no report of activity at the bat boxes as yet. Control of Giant Hogweed has continued as and when required and the original infestation at Mochdre Brook seems to be contained and under control. Once again, no native crayfish have been detected but American Signal Crayfish are widespread. To date, presentations about the river and the Custodian’s activities have been made to eight community groups and schools in the area. Another presentation is to be scheduled to the Newtown Civic Society sometime in their next season. River bank litter picking is continuing but hampered by brambles and debris along the bank. Rex Shayler reported on progress with the Canal Basin project. Planning of this proposed heritage site is at an early stage with funding being sought. Rex will keep in touch with this project and will keep the Custodians informed. Sue Newham reported that the Newtown Town Council would like to reopen the canal to Newtown but this is likely to be a long term activity. Paula Scott reported on the bird survey, organized by Tilde Mans, being carried out at various locations along the river. A great variety of birds are being recorded in this approximately monthly activity. The river fly larvae monitoring is also continuing near the Halfpenny Bridge but it would be good to monitor other locations. Slurry dumping has been reported in the area of Abermule and monitoring there would have picked this up. There is another free training session to be held on July 26th, location to be finalized. Anyone interested should contact Lisa Barlow or Mike Davies. Paula reminded members of the number to call to report any possible pollution incidents, 0800 80 70 60. The bird survey will continue as will the river fly larvae monitoring. Paula would like to initiate a wider survey of flora and fauna which would be aided by a camera trap and/or footprint tunnels. Lisa will check whether funding is available for this and whether existing camera equipment could be re-located to this area. She is also willing to help us with funding applications to other sources. Some training in moss and liverwort identification has taken place and results will be obtained. Invasive monitoring and control will continue and all members are asked to report Giant Hogweed and Japanese Knotweed locations. Attempts to involve young people has continued with presentations to schools but without success in involving high school students. Peter will again contact the high school to try to get their involvement. It was suggested that we could organize some family events during the half term holiday at the end of May. The Custodians will again apply for a stand at the Newtown Food Festival in the first weekend of September. We will try this time to have activities on the river including boats, canoes and coracles. Newtown Town Council and Keep Wales Tidy are to organize Tidy Up events in March. Details are Appendix B. On Friday 30th October the Severn Rivers Trust is to organize another river festival, Leaping Lights, following on from the successful 2015 event. There will be lantern workshops in advance of this and Lisa will provide details. All committee members present agreed to continue and were elected unanimously. There being no other business the meeting closed just before nine pm with thanks to Peter and his wife for their hospitality. I am writing to let you know about two tidy up events coming up in March. Both tidy weeks are encouraging community groups and individuals to get out and do some tidying in their area, as well as joining with community events where possible. It would be great if you were able to get involved in any way. Please contact me if you want more details or want to get involved. Keep Welshpool Tidy Week is a joint event between Welshpool Town Council and Keep Wales Tidy. Friday 4th March: The week will start with a litter pick from the Welshpool Tourist Information Centre at 10.30am finishing around 12 noon. The Rotary Club will be litter picking in the Maes y Dre area after the initial welcome at the TIC. Tuesday 8th March: Planting a wildflower meadow at Dol-y-Felin - Meet at Welshpool Town Council Office at 10:30am or at 10.45 on the field by the play park in Dol-y-Felin. Wednesday 9th March: Litter pick with Montgomeryshire Wildlife Trust, starting at their Severn Farm Nature Reserve at 10am and finishing back at the reserve at 12.30. Bring sandwiches if you want to join with others eating lunch at Severn Farm afterwards. Sunday 13th March: Community Spring Clean Day. Meet at the Tourist Information Centre at 10am, to finish at 12 noon for a hot drink and biscuits. Contact Sue Newham on 07766 757145 or sue.newham@keepwalestidy.org if you want more details. and make our town sparkle! Newtown Town Council and Keep Wales Tidy are working with local people during a week of tidying and sprucing up Newtown ready for the summer. We would like local schools, groups and businesses to plan their own tidy project during the week. If you want to do a tidy event and don’t know where to start, contact Sue Newham, Keep Wales Tidy officer, and she will help you with organising your event and can lend you safety equipment and litter pickers. You don’t have to stick to litter picking. Anything that brightens up the town and makes it more attractive will be very welcome. We are starting at the grass in the Gravel car park at 10am and finishing at 12 noon. We will be tackling Old Kerry Road, the station and Fordd Croesawdy. We are sweeping Broad Street and High Street (and other town centre pavements and pedestrian spaces if there is time.) There will be a Big Sweep photo opportunity when we meet in Broad Street by the entrance to Bear Lanes at 10am. Gloves, hi vis vests and rubbish bags will be provided. We are starting at the grass in the Gravel car park at 2pm and finishing at 4pm. We will be tackling the riverside path between McDonalds and the playing fields. Please register your event or let us know that you are coming along. of Keep Wales Tidy unless otherwise specifically stated. in error, please delete it and all copies of it and immediately notify the sender.